Aerial multi-perspective images can be used for the effective assessment of post-disaster structural damage. Alternatively, rapidly available video data can be processed for the same purpose. However, video quality characteristics are different than those of images taken with still cameras. The use of video data in post-disaster damage assessment has not been demonstrated. 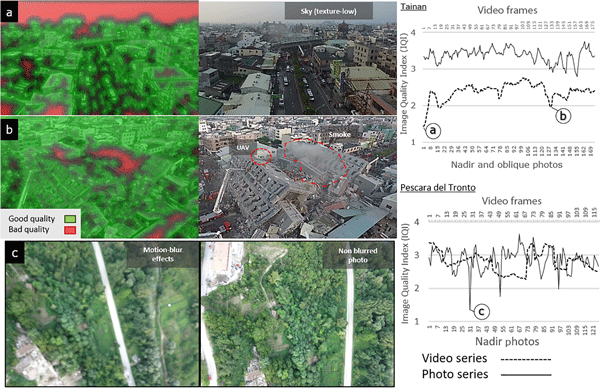 Based on a comparative assessment, our findings support the application of video data in post-disaster damage assessment. In this work, we propose a novel methodology (ReTSVI) to integrate a social vulnerability index into evacuation to flood hazards methodologies. Our results highlight the relevance of including social vulnerability in the planning process. There are distinct differences in the percentage of people evacuated for blocks that are close to each other, which is only explained by social vulnerability since their exposure to the physical hazard and the distance to a safe area are similar. We demonstrated an assessment of the sediments caused by a catastrophic avalanche, induced by the main shock of the 2015 Gorkha Earthquake in Nepal. A Japanese space-borne sensor, PALSAR-2, have a high potential for delineating the hazardous zone. Comparison of pre- and post-high-resolution topographic data estimates the avalanche-induced sediment volume as 5.51 × 106 m3. High-resolution satellite imagery revealed that it has multiple layers of sediment with different physical properties. A local scale GB-InSAR system was implemented for mapping and monitoring slope landslide residual deformations and for early warning purposes in case of landslide reactivations, with the aim of assuring the safety of the valley inhabitants and the personnel involved in the post-event recovery phase. The here presented methodology could represent a useful contribution to a better understanding of landslide phenomena and decision making process during the post-emergency management activities. Landslides are a threat not only to people but also to important infrastructure, like highways. Nowadays there are several monitoring systems that are able to detect slope displacements in order to give prompt alarms. On the other hand, such instruments produce a huge amount of information, which is often not totally used and which can also represent an issue for data storage and transmission. In this paper we explain how we dealt with the large quantity of data provided by one of these tools. L-band SAR remote sensing data are used for identification of high potential risk and susceptible zones for natural hazards of geological origin in tropical environments. Results of this investigation have great potential in terms of a solution to flood disaster management in tropical environments by providing important information to assess the natural hazards of geological origin. This study provides a new method for flood documentation based on user-generated flood images. We demonstrate how flood elevation and building inundation depth can be derived from photographs by means of 3-D reconstruction of the scene. With an accuracy of 0.13 m ± 0.10 m, the derived building inundation depth can be used to facilitate damage assessment. An architectural element of the Royal Castle of Racconigi (northwestern Italy, 17th century) is subjected to nondestructive testing for structural integrity evaluation. It is found that the so-called acoustic emissions – high-frequency vibrations emitted as tiny cracks that develop inside stone and concrete – correlate with those of small nearby earthquakes, suggesting new approaches to monitoring gradual damage accumulation inflicted by such earthquakes on architectural heritage and monuments. We examine the spatiotemporal differences between three TC databases for the southwest Pacific region. In addition, the usefulness of pre-satellite era TC data (1945–1969) is evaluated. While changes in observational technologies from 1945 have undoubtedly improved our ability to detect and monitor TCs, we show that pre-satellite era TC data are not temporally or statistically different to post-satellite era data (1970–present). Snow avalanche data in the French Alps and Pyrenees have been recorded for more than 100 years in several databases. In this manuscript, we present a newly developed web-based system that stores the observed data in a global avalanche database and assists the observers in their daily monitoring activity by providing coherent workflows for a wide range of users with different roles. The new system improves the quality of data and is widely used for fundamental research and operational purposes. This study assesses the value of a novel technology, mobile augmented reality, for rapid damage and safety assessment of the state of buildings in the aftermath of a disaster event. 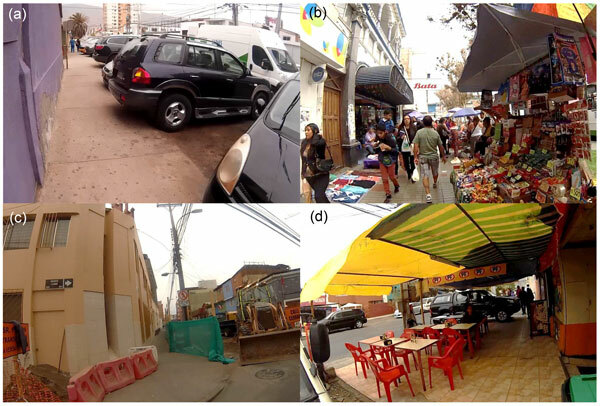 In this study, we propose and demonstrate conceptual frameworks and approaches for in situ ground-based assessment based on augmented reality using mobile devices such as smartphones and tablet PCs. We suggest a generic classification of early warning systems for natural hazards, which distinguishes alarm, warning, and forecasting systems. On the basis of this classification, we developed a three-step framework for evaluating the effectiveness of such systems and illustrate its applicability using case studies. Our results will support practitioners in comparing the effectiveness of early warning systems with those of structural mitigation measures. This paper presents the development and application of a prototype web-GIS tool for risk analysis, in particular for floods and landslides, based on open-source software and web technologies. The aim is to assist experts (risk managers) in analysing the impacts and consequences of a certain hazard event in a considered region, contributing to open-source and research community in natural hazards and risk assessment. The tool is demonstrated using a regional data set of Fella River basin, Italy. This data set contains infrasonic detection bulletin for data recorded between 1 December 2012 and 31 March 2013 by the infrasound array deployed in Ischgl, Austria, and described in the paper. This data set contains all infrasound detections that are used to derive most of the results presented in the manuscript. This study provides an approach for effective disaster management by using geographic information technologies. ADYS, as an interoperable and object-oriented geographic data model, was designed for the activities at the different phases of landslide management. ADYS is compliant with the standards of ISO/TC211, OGC, and Turkey National GIS (TUCBS). ADYS toolbox using open spatial analysis tools was developed for the activities of landslide management.